Kanpur University Placements: The Chatrapati Sahuji Maharaj, [CSJM] Kanpur University, Kanpur provides good placements to its pupils. In order to provide the students with the good respectable job, the University has established a University Placement Cell [UPC] in 2009. The aim of Placement Cell is to provide the job placement facility to its students. The cell not only provides placements to the students of the campus but also to the pupils of the affiliated colleges under it. The University organizes many workshops for campus placements. Career counseling is also done by the cell. The placement cell organizes education fair and job fair at the university level to assist students to find jobs. It conducts industry interface programs to guide the students from time to time. The University's placement cell conducts mock interviews too. When you complete m.com then you got a job in commerce sector. Your starting salary should be INR 10 to 15 k.
• No, I have not done any internships. • Companies like LG, Spice hired some students. • The average salary is INR 1.8 lakh per annum and highest salary was INR 4 lakh per annum. • Alumni Network is solid. I don't do any internship Honestly says they don't call many companies for placements but I think finance can be a good choice Average salary INR 2 Lakh. Less than 20% get placed Alumni have good Network but they only use it for MBA students. This college does not provide any type of internship or also does not provide any placement. No internship. Because I want to study more. IT, Finance companies, marketing companies, like Nokia, hcl etc INR 7lkh per year. 80% gets placed. That's a great network. No, I have not done any internship. Companies like Aditya Birla group, Hcl, LG, Spice etc. Avg salary of alumni is INR 2.0 lakh and maximum INR 1 crore. Since this is a state university so placements are very less. But students perform well in off-campus interviews, also they give good environment for preparation for higher education such as GPAT. students are performing very well in these exams. Alumni network is quite ok. I have not done any internship. There is no campus hiring or placements. Key companies like marketing, finance, and others hire student from our campus. The average salary is INR 50,000 per annum. Around 30% of students get placed. Placement is not so good at Chatrapati Sahuji Maharaj Kanpur University. 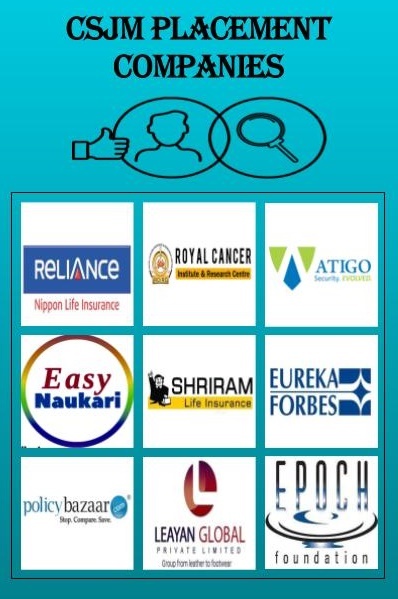 Only a few companies visit the campus for providing the placements. No, one internship it will be done on summer vacation 2017. Some companies like Emphasis, Microsoft visit CSJM Kanpur. The average salary figure is Rs 4 lakhs per annum. The highest salary figure is Rs 12 lakhs per annum. Alumni network is too weak. There are no internships and placements in the college. The internships are provided by the college. Pharmaceutical companies come to Lovely Professional University, [LPU] Jalandhar to hire students. The average salary package is Rs 20,000.